Kelsey, welcome to Homeschool Authors! Tell us a little bit about yourself. I’m 22-almost-23-years-old, which is rather frightening, and a homeschool graduate who loves the Lord, lives at home, writes, works part-time, teaches martial arts, and is interested in many different kinds of things, like studying the Bible, studying history and classic literature, and playing piano, to name a few. But really, there are so many things to learn and to do, and my experiences are limited yet! I live in Texas but I adore seeing new places. The Lord has given me the opportunity to work with two online youth magazines as well – Imagine Mag and HarvestMag. Tell us how you learned about Homeschool Authors. When I first became interested in self-publishing, my friend Sarah Scheele, who is also a writer and homeschool graduate (she’s even been featured on here), told me that Homeschool Authors might be encouraging and helpful to me. I think what made it special was that my mom herself loves learning so much that she worked very closely with my brother and me on every subject. We didn’t use many textbooks (mainly just with the more regular subjects, like math and high school science) but instead learned from what she assembled from various sources. We got to make notebooks of history and science, draw pictures, do crafts, read books, write creative essays, and dress up. She had a lot of great ideas; she’s a tutor now, so you can see how much she loves teaching! My parents read a lot of books aloud, made sure we were well-stocked with our own reading material, and took us to libraries, bookstores, and special book sales, so I was exposed to a great amount of good literature. They encouraged us to be creative, too, so when I was very little I made my own books and wrote and illustrated them. My favorite assignments were creative writing, including the sentences I got to make up in my grammar books. Blessedly, it all came naturally to me – even grammar and spelling. I suppose it was all that exposure to literature, but I don’t remember that first thought of “I’m going to write my own story!” I just always loved the written word. My first pieces didn’t have a plot. But I would act out stories with toys, and so one day the idea of plot must have hit me and I realized I could write down stories similar to what my dolls and animal toys acted – and they could be just as exciting, even if they weren’t physically acted out, because it all happened in the imagination! From then on I would write – or at least attempt – stories every so often until I was a teenager and knew writing fiction was something I wanted to make a lifetime pursuit. I wanted to write a real story, the kind that I could finish and try to publish. 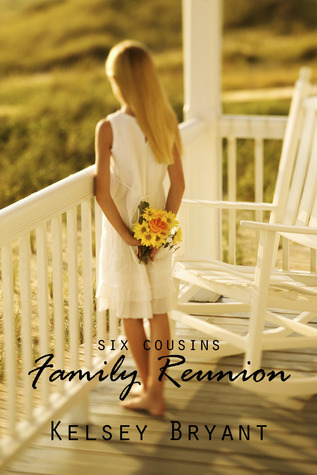 My historical fiction and fantasy stories at the time seemed insurmountable, so I grabbed hold of the advice to “write what you know” and began Family Reunion, which I was calling Six Cousins until I published it. As I wrote, my excitement grew … I could enter fully into this story because I knew or could easily imagine many of Marielle’s (the protagonist) thoughts or experiences. At times it was like journaling, or journaling as my fourteen-year-old self. My inspiration was multi-layered; I brought together a number of things that had always been in my well of fiction-ideas. I love everyday life – it has a lot of wonder, beauty, and potential if we get to searching – so I didn’t want my story to stray too far from that view of the world. I started this story in spring, and ever since then the homey, brilliantly-colored central Texas spring was in the background, inspiring me. I’ve always been intrigued with treasure hunts, mysteries, and the rich, character-driven atmosphere of family reunions. And then there had to be conflict, so I hiked up the contrasts among the six girl cousins and let them loose into the world I’d created. I really wanted my main characters to be homeschooled because, having been there myself, I know that homeschoolers’ lives are often a wealth of imagination, literacy, thoughtfulness, and interesting experiences that make them well-suited as fictional characters. The family of fourteen-year-old Marielle Austin is hosting a week-long reunion at their home. She has five girl cousins – Emma, Caroline, Abby, Kailey, and Reanna – and their grandfather creates three projects for them to accomplish together to win a secret prize: a treasure hunt which has clues all the girls must solve; the cleanup of an old shed; and an inspiring biography of a retired missionary living in town. They must do it with love and understanding, but Abby, Kailey, and Reanna make every task difficult! Marielle and the others have to learn the meaning of friendship and practical love to give the reunion – and their relationship – a happy ending. Who will enjoy Family Reunion? Adult women have said they’ve enjoyed it, even though it’s written for a younger audience, but generally any girl from age 10 or 11 on up would like it. I know of boys out there who have enjoyed it, however, if their sisters were reading it, so I wouldn’t rule them out, either! Amazon.com and my CreateSpace eStore. It is also available as a Kindle e-book. Do you plan to write more books? If you are, when can we expect the next one? Yes! I love writing novels more than any other activity (with the exception of Bible study, however!). Family Reunion has a sequel that I hope to publish this fall. Well, for one thing, I’m so glad you had me! I’m very grateful. If any of you are interested, I’d love for you to visit me at my blog, Kelsey’s Notebook – we talk about books and writing inspiration, among other things! And I just want to encourage all you writers out there to keep it up! It’s difficult to create a publishable piece but if God has laid it on your heart to do so He will make a way. That’s what I experienced. It can also be discouraging to realize how full the market is with books, and how hard it is to get your voice heard, but we as Christians have a responsibility to write good literature that will impact our readers, and the market can never have too much of that. We each have something unique to say, so let’s do our best for God’s glory! Kelsey is giving away one copy of Family Reunion! Your book looks really good, Kelsey! I want to read it! What's your writing routine like? What a sweet-looking book! :) Keep up the good work! Enjoyed reading this post. Thank you for posting this Sarah, and thank you for doing the interview Kelsey! I didn't post a question. How old we're you when your first book was published? Thank you, Emily Ann! I write whenever I can. Usually that's everyday ... sometimes it's not on my novel, but maybe an article, blog post, or letter. I seem to do my best writing at night or on a free afternoon! Thank you for your encouragement, Anna! Thank you all, ladies, for commenting!! God bless!